Portable work stands are a type of sturdy, collapsible workbench ideal for replacing standalone saw horses, automotive maintenance and general work shop applications (Source). The 16 lb., Astro 557010 heavy duty portable work stand is our top pick- it has a hefty weight capacity of 500 pounds, features steel-tube construction, adjusts between 33" to 45" in height and has half inch foam padding on top. Buyers say that it is very stable, is a solid value for the purchase price, though it doesn't fold completely flat. Let's take a look at five of the best-selling portable work stands on the market today and see how they compare. This sixteen pound, Astro 557003 500lb Capacity Portable Work Stand is a great workbench that allows you to adjust the height from 33” to 40”. Users like the fact that it is easy to assemble and is sturdy but the foam padding might not last as long as you might like. The Astro 557003 is made of steel tubing with a ½” foam on the top. It gives you about 14” side to side and can be used to work on such things as doors, bumpers, hoods etc. One user says they have put about two hundred and fifty pounds on theirs and it is holding up just fine. While another says that you get what you pay for, saying that it works and is good for the price, but doesn’t hold up as well as the more expensive heavy-duty work benches. A lot of users were not sure what they were going to get out of the Astro Portable Work Stand but they were surprised and really like that it can fold up for easier storage. The users that seem to have the biggest problem didn’t like the foam that was on top and didn’t trust Astro’s stated five hundred pound capacity. If you are looking for an inexpensive workbench that can be stored easily and help you work on smaller projects then the Astro might be good for you. This fourteen pound, ATD Tools Work Stand is a good workbench with a five hundred pound weight limit. Users like the fact that it is easy to assemble but a few of the customers didn’t get all of the parts when it was shipped to them. 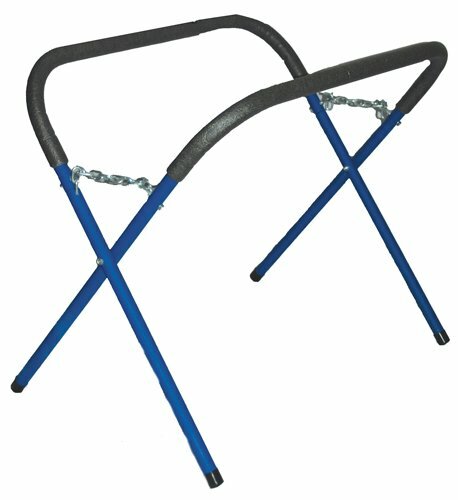 The ATD Work Stand has steel tubing with a ½” foam padding wrapped around the top and also that goes down the side of the steel tubes as well. One user, that works in a body shop, says that they bought two of the ATD 7811 Work Stands for their garage at home and is thinking of getting another one on top of it. Another user was surprised that it was made of heavier construction than they thought it would be. Some even claimed that the ATD work stand can hold a canoe on top of it. The height can not be adjusted telescopically but you can get a little extra height by using the chains on the 7811 Work stand. If you are looking for an affordable yet solid work stand for your garage then the ATD 7811 might be a good choice for you. 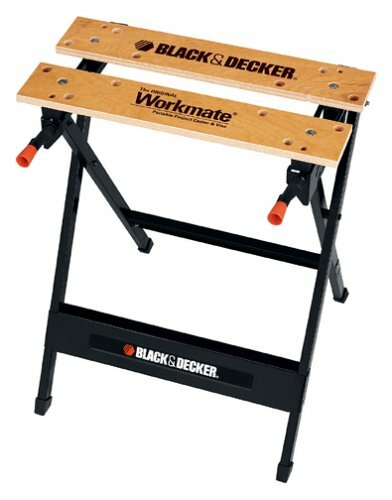 This fifteen pound, Black & Decker WM125 Workmate Portable Work Bench has a 350-pound capacity. It is a great workbench, however, there seem to be no skid-proof feet in place to stop it from skidding. Users love how inexpensive it is and that it is good for small jobs but the quality is apparently lacking a bit. The Black & Decker has the ability to fold flat for easy storage, it also has dual clamp pegs and four swivel pegs that you can angle for more unique jobs. One of the purchasers liked the design of the WM125 Workmate but did not like the quality of the product they received. They go on to mention that it had some broken parts on delivery, and reportedly were not the only ones that had this problem. Another set back according to some of the reviewers is that the instructions are hard to follow. One user, however, points out that you can look up a video of how to put it together online by searching Black & Decker Workmate 125 assembly. If you are looking for an inexpensive workbench to get small jobs done then this might be the way to go. 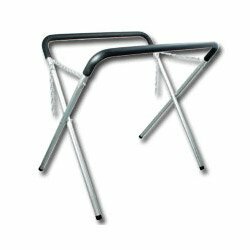 This 1.3 pound, S & G Portable Work Stand Sling is a respectable portable work stand with a 27 ½” wide stretch. Even though there are as not many reviews out there this could be a good product for you if you are looking for something portable to hold onto tools and supplies while you are working on a project. You can use it to hold screws, bolts, fasteners and many other materials without having to always bend over to pick them up or have them rolling around and possibly losing something. The Tool Aid stand is also easy to store- just by folding it up and placing it where ever you need it. The installation process for the harness could not be easier- you just wrap the velcro end around the foam protector of the workbench and you’re ready to use the S&G Tool Aid. 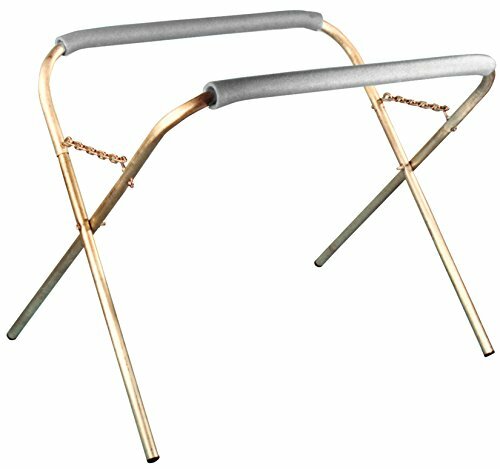 If you are looking for an inexpensive portable work stand that will help you hold tools and materials anywhere, then this product might be for you. This sixteen pound, Astro Extra Heavy Duty Portable Work Stand is a great workbench that can hold up to five hundred pounds. Users love how well made and sturdy it is, but one user bought two and they were from different manufacturers, making the installation slightly different when it came to the size of the screws. The Astro 557010 has the option to adjust the height from 33” to 45” tall. 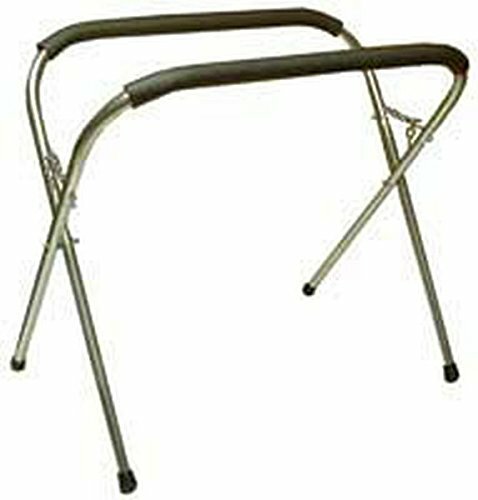 It is made of steel tubing with a ½” foam protector on the top and around the sides. More than a few users mentioned that it was heavier than they expected, but this is a good thing. They were not expecting such a heavy duty and sturdy product as what they got. One user brings up that it doesn’t fold completely flat so when you go to store it, it may take up a little extra space. The most discussed issue about the Astro Heavy Duty Work Stand is that it is very sturdy and reliable for its price. If you are looking for a low-cost but sturdy portable work stand then this might be what you are looking for. If you are in the market for a portable work stand, it's likely that you are looking for a home-solution to replace some old sawhorses, or just a modern and convenient option to perform DIY home repair and automotive maintenance tasks in your garage or work shop. 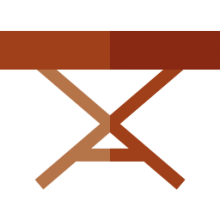 Craftsman that have purchased these portable workbenches prioritize their light-weight construction, sturdiness, the ability to collapse their workbenches and store them in their house or transport them to remote job sites, and they also appreciate the general low-cost of many of the workbenches on the market today. Most of the portable workbenches that we have reviewed feature heavy-duty steel tubing, robust weight capacities all the way up to 500 pounds, adjustable height, protective tube padding, and the convenience of collapsibility- which is great if your workshop doesn't have a lot of space. Many craftsmen have workshops that are dedicated areas for the repair or manufacturer of hobby relations and do-it-yourself projects. Sometimes these workshops are quite small, which means that the portable workbenches that collapse flat are a great way to maximize your modest woodworking & workshop facilities. Sometimes these work shops are really converted garages intended to repair and service automobiles and heavy machines- and they often feature chain hoists, hydraulic lifts, overhead access doors and other ways to manipulate heavy and bulky machining items. Reducing clutter by investing in a collapsible and portable workbench is a great way to maximize space in your work area. It's crucial that when you lay out a workshop that you plan ahead so that it remains a safe space for you to conduct repairs or practice your hobby.